Great in the Garden for tools and pots, at your entrance for hats and scarves, in your room, walk-in closet, and more! Comprised of six side cubbies with upturned lip to keep items stowed, this multi-functional Cubby also has a larger center compartment with removable divider for more flexible storage options. 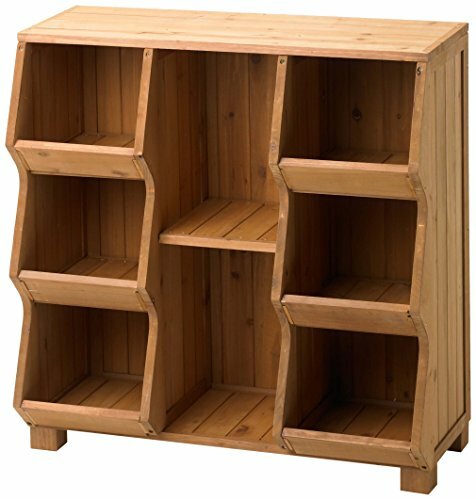 With the feet removed, two units can be stacked to create versatile shelf combinations. Wood is Kiln Dried and Treated with Natural Color Stain to Enhance the Appearance and Durability of the Furniture. Easy To Assemble, Easy to Follow Assembly Instructions and Hardware Included. Phillips Screwdriver Required. If you have any questions about this product by Merry Garden, contact us by completing and submitting the form below. If you are looking for a specif part number, please include it with your message.